This BBQ grill cake was a blast to make! The 70-year-old Birthday Boy is a grilling guru with his own catering company. The chocolate cake was filled with ganache and covered in modeling chocolate around the outside. The top was coated in Chocolate Swiss Meringue buttercream which was then manipulated to look like flames. Once crusted, the flames were painted on the edges with orange, red, and yellow. Charcoal “briquettes” were then piped onto the corners and the grill grate was piped with royal icing over the top of everything. Once dry, the grate was painted in edible silver paint. 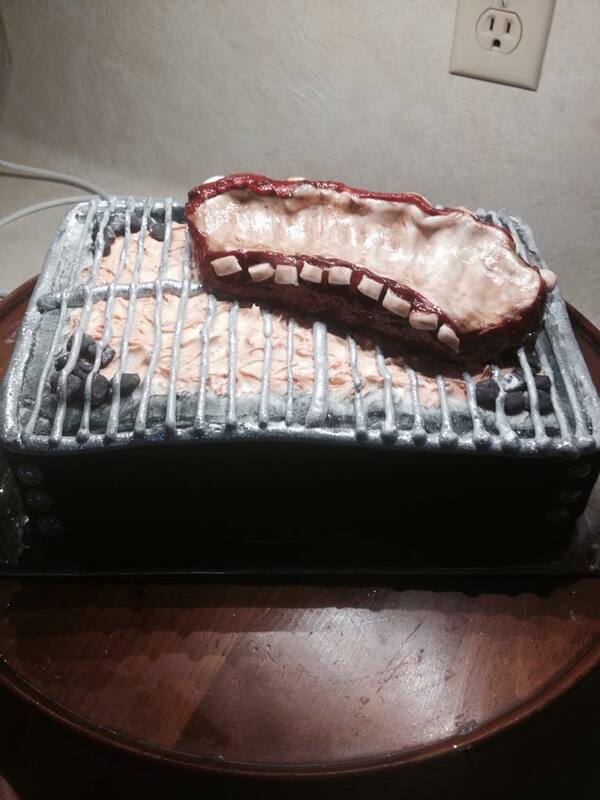 The rack of ribs was hand molded out of modeling chocolate and brushed with tinted piping gel. The birthday boy received lots of “ribbing” on his birthday, but he says these were his favorites!! Posted in UncategorizedTagged BBQ, birthday, boy, cakes, father, food cake, man, modeling chocolateBookmark the permalink.